WASHINGTON (AP) — President Donald Trump says the economy would have grown much faster last year if the Federal Reserve had not been tightening credit last year. WASHINGTON (AP) — The federal government shutdown will cause slight permanent harm to the economy — about $3 billion — according to a report Monday by the Congressional Budget Office. The report says the five-week shutdown has slowed growth in the near term but that most of the lost growth "will eventually be recovered." WASHINGTON (AP) — The U.S. economy has turned in a stellar performance this year. But mounting problems, from trade tensions to jittery financial markets and political gridlock in Washington, are expected to sharply slow growth in 2019. WASHINGTON (AP) — The U.S. economy expanded at a solid 3.5 percent annual rate in the July-September quarter, led by lower but still strong consumer spending and more business investment than previously estimated. BERLIN (AP) — A closely watched survey is showing a slightly bigger-than-expected decline in German business confidence after the economy shrank in the third quarter. The Ifo institute said Monday its confidence index fell to 102 points for November from 102.9 in October. Economists had expected a decline to 102.3 points. Managers' view of both their current situation and their prospects for the next six months darkened. It was the third successive monthly decline in the index. BATON ROUGE, La. (AP) — Louisiana posted growth of 4.3 percent in real gross domestic product during the second quarter, ranking 12th in the nation for growth. The Advocate reports the U.S. Bureau of Economic Analysis released the figures Wednesday. They represent the second straight quarter of strong growth in Louisiana after a poor showing in 2017. WASHINGTON (AP) — The U.S. economy grew at a robust annual rate of 3.5 percent in the July-September quarter as the strongest burst of consumer spending in nearly four years helped offset a sharp drag from trade. MILAN (AP) — The Italian government on Wednesday softened budget deficit targets that have alarmed investors and eurozone partners, saying they would be gradually lowered after 2019. Economy Minister Giovanni Tria confirmed that the deficit to gross domestic product ratio next year would be higher than agreed by the previous government with the European Commission. But he added "that there would be a gradual reduction in the deficit in successive years." WASHINGTON (AP) — The U.S. economy grew at a robust annual rate of 4.2 percent in the second quarter, the best performance in nearly four years, though economists believe growth has slowed in the current quarter partly because of a drag from trade. The performance of the gross domestic product, the country's total output of goods and services, was unchanged from an estimate the Commerce Department made last month, the government reported Thursday. WICHITA, Kan. (AP) — Wichita was the only major metropolitan area in Kansas that didn't experience economic growth last year, according to new federal data. The U.S. Bureau of Economic Analysis released figures this week showing that the Wichita area's gross domestic product declined 1.4 percent in 2017, the Wichita Eagle reported. BISMARCK, N.D. (AP) — An economic consultancy hired by the North Dakota Legislature predicts the state's economy next year could surpass the record set in 2014. Economist Jim Diffley of IHS Markit told the Legislative Revenue Advisory Committee Thursday that the state's economy is expected to reach 6 percent growth in 2019. Diffley told reporters the growth would increase North Dakota's gross domestic product to $61.9 billion, up $1 billion from 2014. GDP measures total economic production. SAO PAULO (AP) — Brazil's economy contracted nearly 1 percent in the second quarter due to a trucker's strike, the country's Central Bank said Wednesday. The nine-day strike that ended in late May caused fuel shortages, cut into food deliveries and backed up exports. The Central Bank said Latin America's biggest economy shrank 0.99 percent. WASHINGTON (AP) — President Donald Trump is distorting the truth on U.S. economic growth and jobs, pointing to record-breaking figures that don't exist and not telling the full story on black unemployment. BEDMINSTER, N.J. (AP) — President Donald Trump said Tuesday he thinks gross domestic product growth in the next quarter "could be in the 5s" — that is, higher than 5 percent. 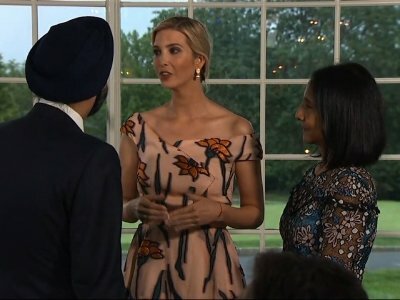 Trump made the bold prediction Tuesday evening before a dinner at his Bedminster, New Jersey, golf resort with leaders from FedEx, Mastercard, Boeing, PepsiCo and other companies. WASHINGTON (AP) — The U.S. economy accelerated last quarter at an annual rate of 4.1 percent, the government estimated Friday, as consumers spent tax-cut money, businesses stepped up investment and exporters rushed to ship their goods ahead of retaliatory tariffs. WASHINGTON (AP) — President Donald Trump falsely claimed Friday he's pulled off "an economic turnaround of historic proportions." Speaking at the White House after the government reported that the economy grew at an annual rate of 4.1 percent in the second quarter, Trump declared that the gains were sustainable and would only accelerate. Few economists outside the administration agree with this claim. WASHINGTON (AP) — The economy grew at a slightly slower pace last year than previously believed, but Americans' saving rate was a lot higher, thanks to a flood of previously unreported income. Those are some of the findings in the government's latest comprehensive revision of its report on the gross domestic product — the country's total output of goods and services. WASHINGTON (AP) — President Donald Trump is prematurely claiming he proved naysayers wrong in boosting U.S. economic growth. Speaking at events Thursday in Iowa and Illinois, Trump claimed victory in advance of Friday's government release of quarterly gross domestic product data, saying "nobody thought we were going to be this great" and that when he became president, "those numbers were bad." WASHINGTON (AP) — U.S. economic growth in the first quarter was revised down to a lackluster 2 percent — a sharp deceleration and the poorest showing in a year. But economists expect a significant rebound in the current quarter, forecasting a sizzling growth rate of 4 percent or more. WASHINGTON (AP) — A group of top business economists believes the major tax cuts President Donald Trump pushed through Congress will give a significant boost to economic growth this year and next year. But they worry that by 2020, the country could be entering a new recession. WASHINGTON (AP) — Americans boosted their spending by 0.6 percent in April, the biggest increase in five months and a strong indication that the economy is reviving after a winter slowdown. The Commerce Department said Thursday that last month's increase in consumer spending was the largest increase since a 0.7 percent rise last November. WASHINGTON (AP) — The U.S. economy grew at a weaker 2.2 percent annual rate in the first three months of the year, as consumers and businesses slowed their spending. But given the economy's recent performance, analysts are still looking for a solid rebound in the current quarter. BERLIN (AP) — Germany's defense minister says Berlin will raise its military spending to 1.5 percent of GDP by 2025 — far short of the 2 percent goal demanded of NATO members by U.S. President Donald Trump. Defense Minister Ursula von der Leyen said Monday that defense spending will reach 1.3 percent next year. She plans to tell allies at next month's NATO summit that Germany "wants defense spending's share of the gross domestic product to reach 1.5 percent in 2025." SACRAMENTO, Calif. (AP) — California's economy has surpassed that of the United Kingdom to become the world's fifth largest, according to new federal data made public Friday. California's gross domestic product rose by $127 billion from 2016 to 2017, surpassing $2.7 trillion, the data said. Meanwhile, the UK's economic output slightly shrunk over that time when measured in U.S. dollars, due in part to exchange rate fluctuations. WASHINGTON (AP) — The U.S. economy slowed to a moderate 2.3 percent annual growth rate in the first quarter as consumer spending turned in the weakest performance in nearly five years. Still, the January-March increase came in better than expected, supporting hopes for a solid rebound for the rest of the year. All eyes will be watching U.S. economic data this Friday, but the focus could quickly turn to a different kind of growth. With the initial report on gross domestic product forecast to show a first-quarter slowdown that’s become familiar in recent years, figures on employment costs — due at the same time, 8:30 a.m. in Washington — have the potential to steal some thunder, especially if they top forecasts. WASHINGTON — The Congressional Budget Office last week released its annual budget and economic outlook report, and, although the news was gruesome, the report was greeted in Washington with a giant yawn. The assumption among Republicans and Democrats is the political rewards for curbing runaway budget deficits are too meager to justify the risks. There’s a consensus to do nothing — and to hope nothing goes disastrously wrong. Just how large are impending deficits? Here are the CBO projections. WASHINGTON — The U.S. economy grew at a solid 2.9 percent annual rate in the final three months of last year, a sharp upward revision that caps three quarters of the fastest growth in more than a decade. The Trump administration is hoping the economy will accelerate further this year, aided by sizable tax cuts and increased government spending. President Trump's proposed $1.5 trillion infrastructure plan would pay off with not only gleaming new highways but a significant boost to the U.S. economy, according to a analysis released Wednesday by the White House Council of Economic Advisers. The council estimates that the 10-year infrastructure program could add between 0.1 and 0.2 percentage point to average annual real growth in gross domestic product (GDP). That's tens of billions of dollars to America's more than $19 trillion economy. WASHINGTON (AP) — The U.S. economy grew at a solid 2.9 percent annual rate in the final three months of last year, a sharp upward revision that caps three quarters of the fastest growth in more than a decade. The Trump administration is hoping the economy will accelerate further this year, aided by sizable tax cuts and increased government spending. MILWWUKEE, Wis. (AP) — A new analysis from a Wisconsin business group says Foxconn Technology Group's manufacturing plant would add about $51 billion to the state's gross domestic product over the 15 years the state pays the company incentives. SAO PAULO (AP) — Brazil's government says the country's economy grew in 2017 for the first time in three years, aided by a strong performance in the agricultural sector. The government's IBGE statistics bureau said Thursday that the country's gross domestic product increased 1 percent last year after two consecutive contractions of 3.5 percent in 2015 and 2016. BERLIN (AP) — The German economy accelerated last year to grow by 2.2 percent, putting in its strongest performance for six years thanks primarily to increasing demand at home, official data showed Thursday. The figure released by the Federal Statistical Office was the strongest since 2011, when Europe's biggest economy grew by 3.7 percent. Gross domestic product expanded by 1.9 percent in 2016 and 1.7 percent in 2015. WASHINGTON (AP) — Led by a rise in business investment, the U.S. economy grew at an annual pace of 3.3 percent from July through September, its fastest rate in three years. The Commerce Department estimated Wednesday that third-quarter growth exceeded the 3 percent annual expansion for the period that it had initially reported last month. The 2017 Michigan Economic Competitiveness Study was recently released by the Michigan Chamber of Commerce Foundation and Northwood University. The sixth annual study confirms that Michigan is making great progress at the state level since the Great Recession ended in 2009. BOSTON -- While consumer spending has been "surprisingly weak," the Massachusetts economy jolted forward in the third quarter, with real gross domestic product surging 5.9 percent and employment growth also outpacing the national rate, according to a new report. WASHINGTON (AP) — The U.S. economy grew at an upgraded annual rate of 3.1 percent in the spring, the fastest pace in more than two years. But growth is expected to slow sharply this quarter in the wake of a string of devastating hurricanes. KAVOURI, Greece (AP) — The eurozone's top official said Monday that Greece and its European creditors are on a good path to completing the latest round of bailout talks, with a view to a "clean exit" from strict fiscal supervision. Jeroen Dijsselbloem said the recession-battered country is regaining credibility, with a "very strong" fiscal performance in 2016 and 2017. An important economic indicator, the 2016 Gross Domestic Product report from the U.S. Bureau of Economic Analysis, shows the Floyd County economy chugging along at a steady pace. The 2016 report shows GDP locally increased by 3 percent from 2015. When taken together, the 385 Metropolitan Statistical Areas across the nation grew at a composite rate of 1.7 percent. JOHANNESBURG (AP) — Two of Africa's leading economies said Tuesday they have emerged from recession. South Africa and Nigeria released figures showing economic growth in the second quarter of this year. South Africa's government said the gross domestic product grew by 2.5 percent in the quarter, helped by the agriculture, forestry and fishing sectors. The country announced in June it had entered recession. WASHINGTON (AP) — The U.S. economy rebounded sharply in the spring, growing at the fastest pace in more than two years amid brisk consumer spending on autos and other goods. The gross domestic product, the broadest measure of economic health, grew at an annual rate of 3 percent in the April-June quarter, the Commerce Department reported Wednesday. It was the best showing since a 3.2 percent gain in the first quarter of 2015. WASHINGTON (AP) — The Commerce Department issues its second look at the performance of the overall economy for the April-June quarter. The report will be released at 8:30 a.m. EDT Wednesday. WHAT'S EXPECTED: The expectation is that the overall economy, as measured by the gross domestic product, grew at an annual rate of 2.7 percent in the second quarter, according to the consensus of economists surveyed by data firm FactSet.